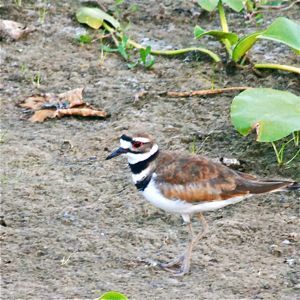 Killdeer, photographed at Green Cay Nature Center, Boynton Beach, Palm Beach County in June 2010. 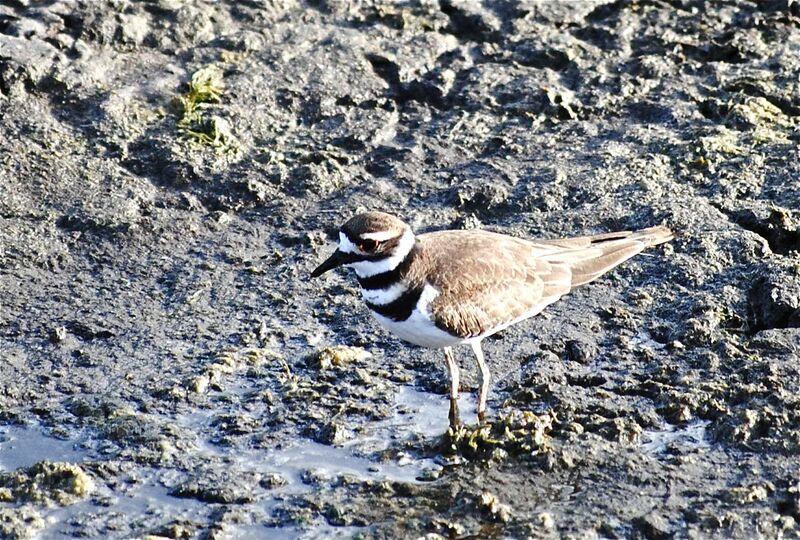 To our knowledge, a killdeer, Charadrius vociferus, has never actually killed a deer. So why the name of this small, sandpiper-like bird? Its call is kildeer or killdeeah. Really. 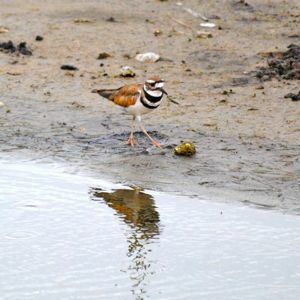 Killdeer is a member of the plover family of shorebirds, but this shorebird also likes drier habitats. 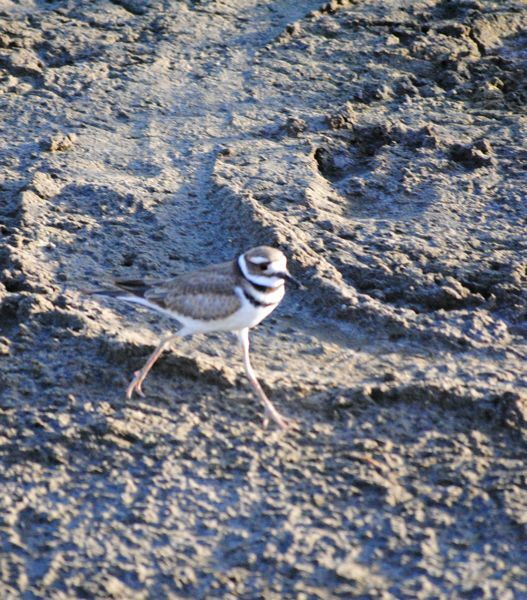 You'll spot this bird on mud flats, banks and cultivated fields, parks, golf courses and even parking lots. It is a fairly easy bird to recognize. It goes about 8 to 11 inches in length, with a wingspan that can approach 19 inches. It is light brown on top, white underneath. It has wide alternating white and black bands on the throat and chest, which really set this bird apart. It's found year-round in all of Florida, as it is most of the southern two-thirds of the United States. A portion of the population is migratory, breeding during the summer in the northern tier of the United States, throughout Canada and as far north as Canada's Yukon and Northwest Territories. In winter, these birds will travel to Central America and to the northern shoulders of South America, including Venezuela and Colombia. There's also a year-round population along the western coast of South America. Killdeers nest on open ground ground, scooping out several shallow depressions before selecting one where the eggs will be laid. The parents add twigs, rocks and even trash as they go along. 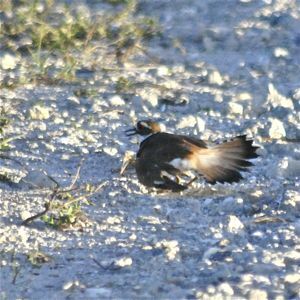 Occasionally, killdeer will nest on the pebbly surface of a flat roof, which can pose a dangerous challenge to chicks trying to get to the ground. Clutches are four to six eggs that require three to four weeks of incubation, which both parents handle. Chicks are able to walk about shortly after hatching and are able to feed themselves. Both parents, however, attend to their young. The parents protect the nest from predators by drawing attention to themselves through loud calls, head bobs and running away. They'll also act as if they have a broken wing, distracting predators looking for an easy meal. It takes three to four weeks for hatchlings to fledge. 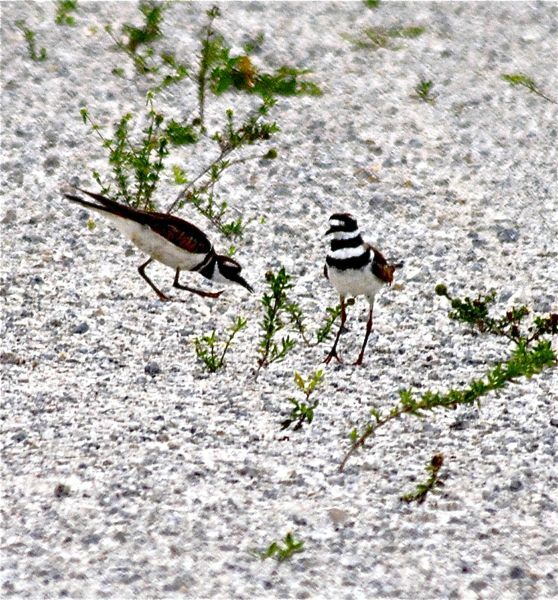 A killdeer pair can have a second brood during the same season. They stay together for a year or longer. Killdeers are ground foragers. They feed on bugs, including beetles, grasshoppers and larvae, plus worms, snails, crayfish and occaisonally frogs. It will also eat seeds gleened from a farmer's field. 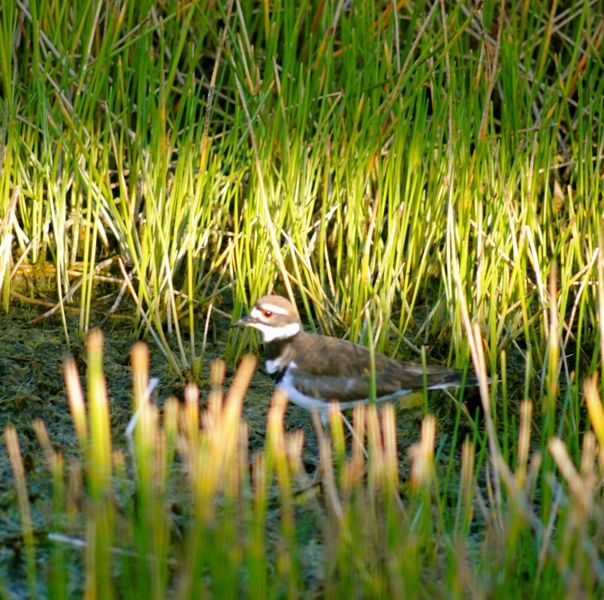 We've had the most success spotting this bird when water levels are down around wetlands and ponds and mud flats become exposed, particularly Green Cay Nature Center. But we've also seen a fair number along rocky levees at places like Loxahatchee National Wildlife Refuge and Stormwater Treatment Area 1 East along Southern Boulevard west of Wellington. Killdeers are members of Charadriidae, the plover family. Other common names include chattering plover and noisy plover. Vociferus indeed.